Our bodies are the libraries of our lives. They hold our stories, our lovers, our babies our dreams. They carry our spirit and herstory everywhere. When they are bigger than expected they may defy conventional norm, but this does not mean they are unhealthy, unlovable, or unattractive. All the destructive "un" words assigned to us. On the contrary, it takes courage, humor and stamina to be fat. Living life in a fat body is a deeply humanizing experience. 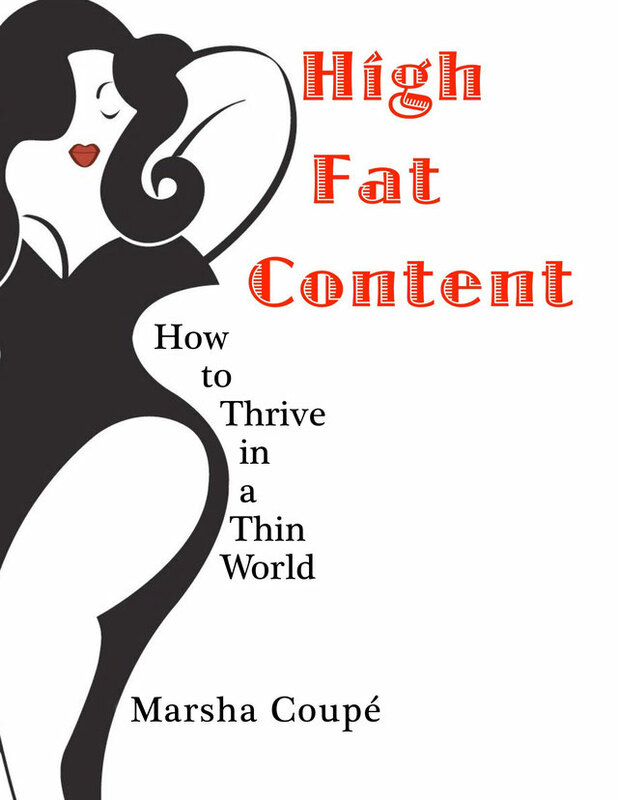 Fat is soft; feminine; spacious; luscious; sensual; playful; yielding; comforting; generous; protective and provocative. It can ground you and slow you down a bit, allowing more time for observation and responding to our surroundings. Big bodies house big spirits. It's generosity, not greed, that makes us expansive. Like many large people, I have a tough time navigating our one-size-fits-all world. Besides feeling cramped in most public places, my physical reference points are not respectfully represented in the media, business, art, or entertainment. When round bodies are depicted in the public arena, it's nearly always to illustrate the sins of gluttony and slothfulness. Our heads are decapitated to better emphasize abundant bellies, thighs and bottoms. These crude images are used to warn others of the perils of obesity. 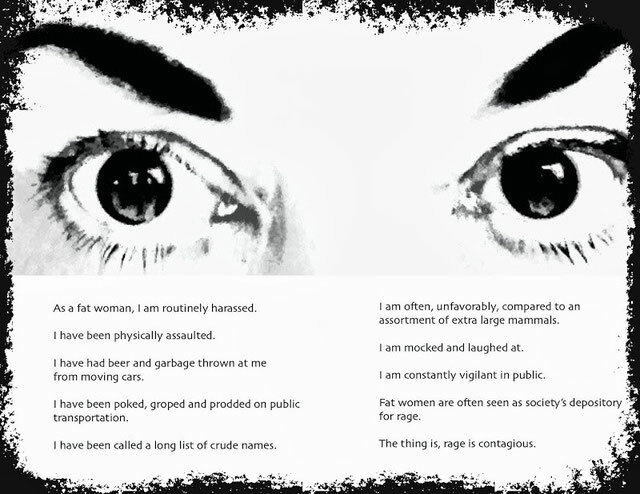 They dehumanize and ostracize people-of-size, while encouraging prejudice, ridicule and abuse. Imagine if the faceless, decapitated fatties, flogged by the media, were replaced with the same kind of images used to represent everyone else. Why not show us from the top of our coiffed heads, to the tip of our well manicured toes, in real life situations, beyond waddling through supermarkets and malls? How often do you see images of a woman my size confidently frolicking on the beach in a swimsuit? Sailing the Mediterranean? Giving a presentation in a boardroom? Joyfully preparing a gourmet meal with her lover? Driving a sports car? And yet all over the world, we're doing just that. If any other group of people were shown as a lethargic, headless, heaving mass of humanity, it would not be tolerated. Nor should it be. Imagine the headless fatty photos, and television footage, replaced with decapitated elders, babies, priests, or politicians. Well, maybe the last one, but you get the point. The only people routinely shown without heads, in thousands of inflammatory images a day, are fat folks. 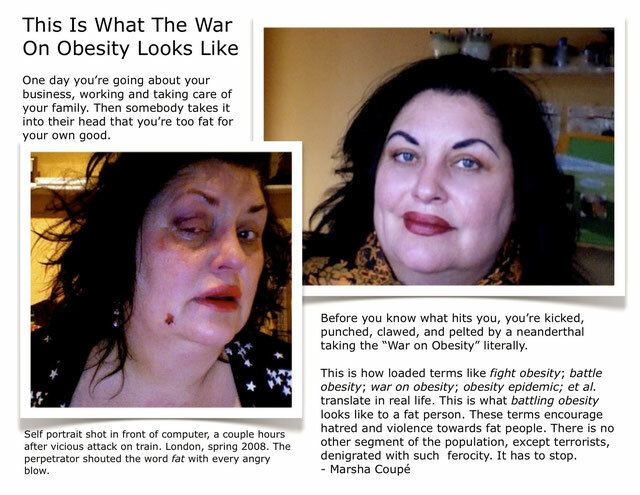 This puerile propaganda, largely fueled by special interest groups, funded by big pharma and the diet industry, as well as governments and a stunningly lazy media, is billed as “The War on Obesity.” Like all wars, it brutalizes those living within firing range. Women and children are particularly vulnerable, should we fail to conform to the narrow size range prescribed for us. Instead of being encouraged to live healthy lives at every size, we are constantly told we cannot be healthy unless we lose weight. This is a baldfaced lie. Rather than allowing ourselves to be bullied into dieting, taking dangerous weight loss drugs, or succumbing to the barbaric butchery of bariatric surgery, let’s refuse to allow others to define the size a body should be. There is no freedom greater than the freedom to be our natural self. In a democracy, the job of government, media, education, and medicine is to support freedom for all people, the opposite of bullying and fearmongering. I have lived in a fat body half my life. This fact alone makes me an “obesity” expert. Like most substantial people, my journey to self acceptance has not been easy. If not for discovering the size diversity movement, it's likely I would be one of the estimated 6-million people who have had weight loss surgery, and all the complications that go with it. During the early period of my burgeoning girth, and even for sometime after I became a fat woman, I harbored many of the same notions about fat people I now challenge. 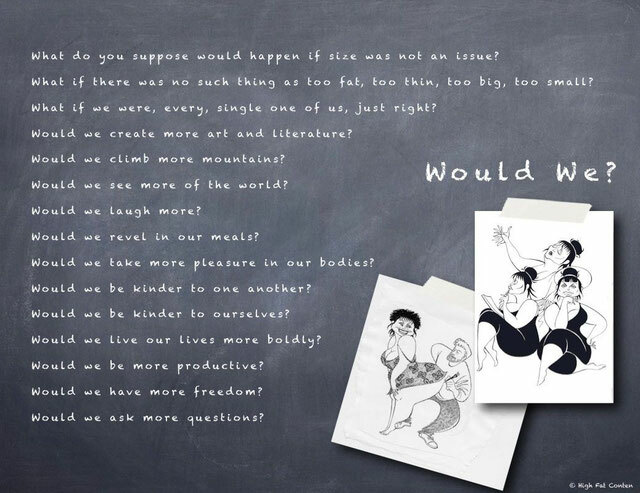 I'm ashamed to admit that I did not hire fat people to work in my ad agency. I thought we fatties weren't hip enough for an image conscious business. Being in media, I bought into the mindless stereotype of fatness as something to be cured, rather than accepted as another body type. Though the concept of dieting never made sense to me, I tried several caloric restriction regimes as I grappled with how to make peace with my big body. Each time I failed to slim down for more than a few months, I’d try to figure out another solution. This wasted a lot of brain tissue that could have been better used elsewhere. There is nothing more uninspired than weight loss talk. 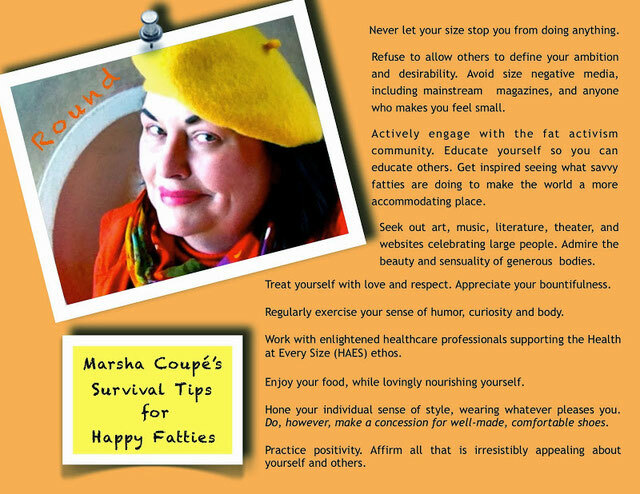 As the Fat Acceptance Movement metamorphosed into the Size Diversity Movement, and then into the whole Body Positivity Movement, I made a conscious decision to not allow weight to define my life. Falling in love with a handsome man, with a natural preference for an abundant woman, also dramatically changed my ideas about desirability, sensuality and beauty. Love makes us feel that anything in the world is possible. It lifts us to higher ground, whatever size we are. Martin Luther King Jr. famously said: "Our lives begin to end the day we become silent about things that matter." I'll not be silent about things that matter. 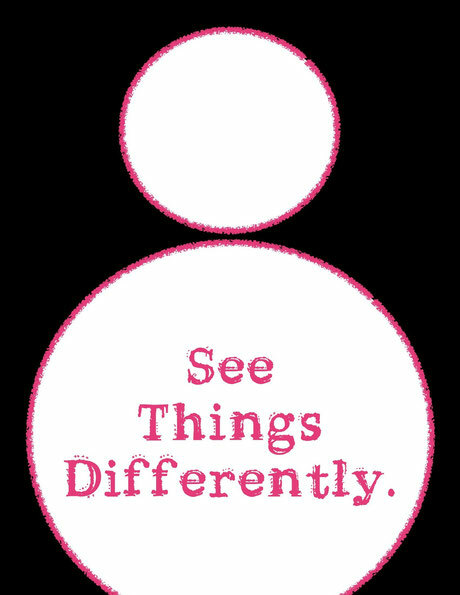 Judging others based on size, age, color, religion, physical prowess, financial acumen, or sexual orientation, is a shamefully ignorant way to go through life. Size is not an indication of intelligence, health, fitness, accomplishment, abilities, or worthiness. 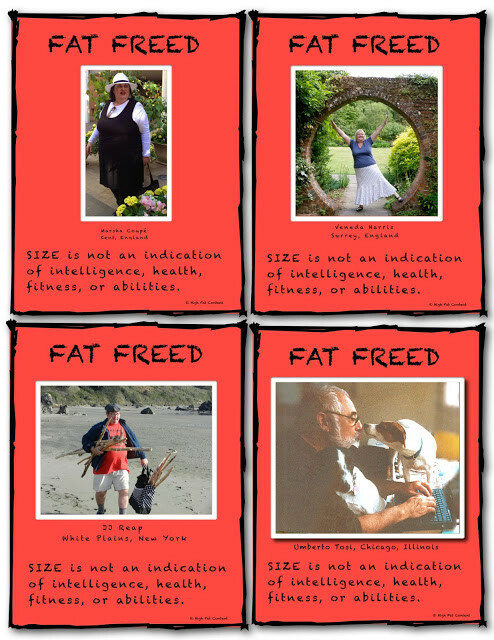 If you'd like your own FAT FREED mini poster, click the poster below to send me an email. Be sure to include a quality photo of yourself, preferably outdoors in natural light, along with your name and location.